Evernote is one of the most popular online information organizers that allow you to easily save and safely store any kind of information that you might need. With it you will increase your productivity and make your life better organized and streamlined. Evernote can manage daily to-do lists, store content you have found on the internet (text, icons, images), application shortcuts and many more. With intuitive Web Clipper feature, you can easily drag and drop content from the internet, and Evernote will save everything for later use, including the URL from which that content was taken. Keep your life organized and inspirations remembered. Evernote is one of the most famous notetaking and archiving software packages in the world, currently being available on 10 operating systems (from Windows and Mac, to portable devices such as iOS, Androd and Blackberry). With it millions of people around the world collect ordinary text, formatted text, URLs, webpage content, images, handwritten notes, and more, with full control over how that note will be saved (name of note, tag, directory, special annotation, comment). 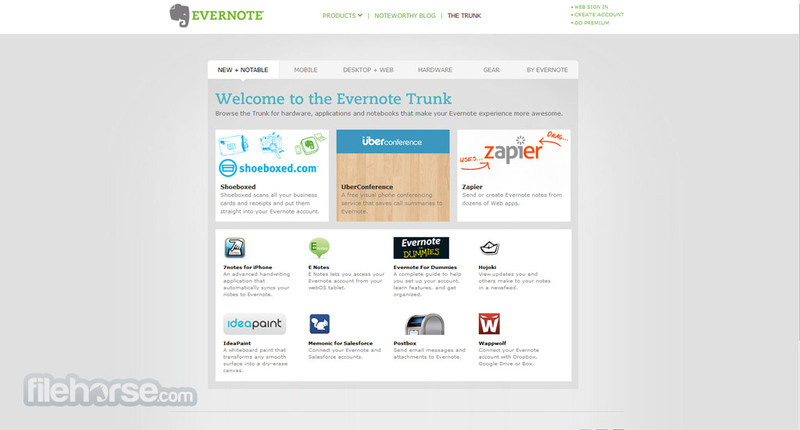 However that is just a base that enabled Evernote’s popularity. Feature that trulyl enabled its rise is power of cloud computing, automatic content syncing across all supported devices you own, and the ability to access your data from every internet-connected PC in the world. Just go to Evernote’swebapp, and all your work notes, school reminders, purchasing lists and other data will be there. Great online information organizers! Founded in 2005 by Stephan Pachiko, this Californian internet service soon took over the world, becoming one of the 1000 most visited websites in the world. Here we will describe some of its most important functions, both in its webapp and standalone client app. 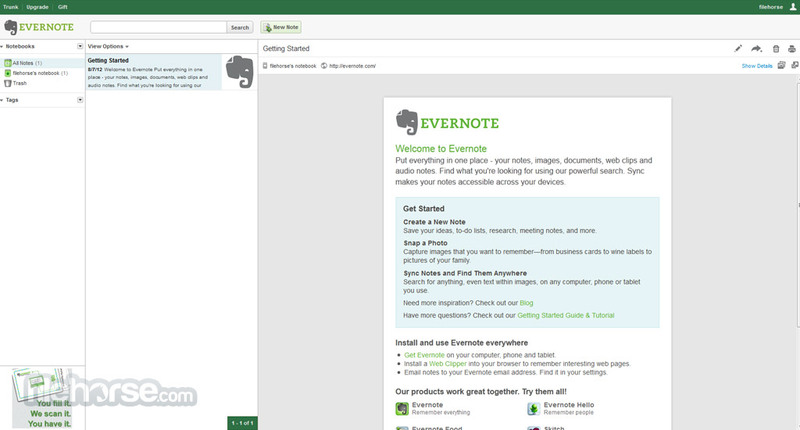 Evernote can be described with one word – flexibility. It gives you the choice of accessing its notetaking service on every computing device you own, from gathering data while you are browsing the internet, taking notes on you tablet while you are in school, or quickly accessing you shopping lists while you are on your phone. Every piece of data that you collect with it is automatically sent to the cloud, where it is dispersed to all your devices via secure network protocols. With great API support that is directly introduced in many applications on both desktop, mobile and the cloud, writing data into Evernote can even speed up your work in other areas of your life. For example, blog publishing platform Postach.io is fully built around the notion that your text, images and video embeds will be created directly from Evernote. All that you need to do to publish those blog entries is to save your note in predetermined Postach directory on your device, and Postach.io will automatically grab that file. With perfect sync, safe storage of all your data and easy way of bookmarking websites (entire pages are saved, including text, images and link), Evernote represents all-in-one solution for your notetaking. Research, collaboration, event planning, quick data saving… all can be done with Evernote online information organizers with ease and style. 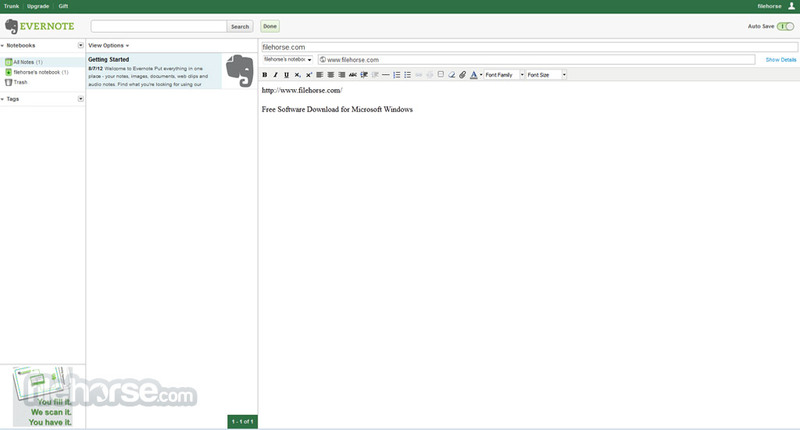 Interface of Evernote is modern, stylish, fast and very functional. Its webapp supports full access to your data, with ability to store new entries, organize saved ones, search, tag, share and more. Every service and client app of Evernote is designed to be easy to use, with its UI being instantly recognizable on no matter what device or what screen size you are using. Account registration for Evernote is totally free, giving you the access to almost all features it offers. More demanding users can elect to pay for Premium license ($5/month or $45/year), which will give them ability for more robust collaboration, support for offline note accessing, better security options, larger online storage, search function that seeks data inside files and more. Evernote is a trulywonderfulnotetaking tool that can be used easily by almost everyone. Its fast, secure, versatile, and can help you increase your productivity not only in your work or school, but also during your downtime. Try it out! Save entire webpages to your Evernote account with lightweight browser extensions. You get the whole page: text, images and links. You’re always moving, your notes should be too. With Evernote, your memories are on every computer, phone and device you use. Keep all of your itineraries, confirmations, scanned travel documents, maps, and plans in Evernote, so you’ll have them when you need them. Powerful online information organizers!